Women have always sought the companionship and support of other women. We have gathered in kitchens, campuses, and playgrounds, cafes and factories, our places of worship. Prenatal classes segue into playgroups and babysitting clubs. 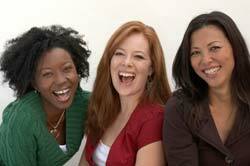 Our female friends and relatives provide guidance and help us shoulder our burdens. The Mother-Daughter Project draws on and extends the relationship- and community-building that comes automatically to many women. You may already have a robust community that shares your hopes for your daughter and you, but if you don't (like many of us mothering today) you can create one yourself. You don't need our book to start a group, but if you want more guidance, it's full of practical suggestions. Before bringing your daughters together, meeting first as mothers gives you time to get to know each other and create a common vision of your hopes for mothers and daughters. It is not necessary to agree on all the ways you parent your daughters, but for a group to work, members need to know and respect each other's values. You are building a community of women for your daughters to join. The trust you develop with each other will determine its strength. We recommend five or six meetings for mothers only before inviting daughters to join. Trust comes from experiencing that your group can compassionately hear your sometimes tender and difficult stories of mothering-and of being a daughter. Sharing frankly about your relationship with your own mother provides insight. Openly discussing the challenges you faced as a teenager and young woman can be a balm and helps you identify your strengths and vulnerabilities as your daughter negotiates adolescence. When you feel as if you have hit a dead end, other women can add their novel perspectives and help you see a way through. An ideal size for a group is four to six mothers. A group can be as small as two and larger than six, but the larger the group, the harder it is to establish the trust and comfort level needed to share true feelings about intimate topics, plus it can become logistically tough to get everyone together at the same time. Groups can start on-line or be time-limited; they can meet monthly for an evening or biannually for a weekend. We found it easiest to create groups in which the daughters are all within a year or two of the same age. And it's never too late to start a group - whether your daughter is seven or eleven or sixteen. After everyone has shared her hopes, discuss them, and star the ones you all agree on. These are the goals that can guide your group. As you discuss group guidelines, encourage mothers to ask themselves, What do I need to make this group work for me? Be creative. What's important to you? Meeting in each other's homes or a neutral space, getting help with childcare, bringing food to share or not? In our group, we had a No cleaning, no apologies rule because we wanted to make it explicit that we weren't meeting to judge each other's homes or to make more work for ourselves. Each group is unique. Acknowledging individual needs and differences will help foster a safe, nurturing environment. To encourage shared leadership, invite two mothers to volunteer to lead the next meeting, decide if you will be doing a reading beforehand, and confirm date, time and location. Create a name, phone, and e-mail list for group members. Often at this point, the idea of starting a group is so exciting that women will want to invite every mother they know to join! Be clear in the first meeting that mother-daughter groups work best when they are relatively small. If there is a lot of interest, we strongly suggest establishing two or more groups organized according to the daughter's ages. As in any group, sticky issues can arise. Letting interested friends and acquaintances know that the group size is fixed and limited and encouraging them to start another group can allay a sense of being "left out." Likewise, simply not talking about your group (unless asked) in front of other mothers protects their feelings. It's common in the first six months for some mothers to decide that a group isn't a good fit for them and drop out; if your group seems too small, you can invite other mothers to replace them. We suggest beginning every mothers' meeting with a check-in to see how each mom is doing and share what is going on in her and her daughter's life at the moment. It's a way to get to know and stay current with the other women, and it works best if you hold back comments and responses until every mother has checked-in (reminded by the facilitators if necessary) both for expediency and to not get drawn into conversation before hearing from every woman. Then open up a general topic of discussion, either one that was pre-determined, or something raised by a mother in her check-in. The first section of our book, The Mother-Daughter Project (from Penguin Group USA), can be used to spark conversation for the first six (or more) meetings after your introductory get together. It is organized so that you can read one chapter in advance and then discuss it or respond to the suggested questions together at a meeting. After mothers have been getting together for about six months, or whenever the moms all feel ready, its time for your first mother-daughter gathering. The initial meetings should focus simply on having fun and getting to know the other mothers and daughters, then gradually add in activities that have more content. (Part II of our book offers age-appropriate, year-by-year curricula.) You can start a mother-daughter group when your daughter is any age, but it's easiest to start when girls are ten or younger because they are less self-conscious and can bond with other girls more readily. Older girls will become close, but be patient, it can take time. Girls of different ages respond to different kinds of invitations. You can simply tell a ten year-old or younger that the two of you will be joining a mother-daughter group to have a good time, learn things about growing up as a girl and make friends with other mothers and daughters, and she will probably be openly excited to join you. A girl who is eleven to fifteen will be secretly thrilled when you explain to her that now that she is getting so grown-up, you want to find ways to stay connected with her and have a good relationship. You can tell her that hanging out and doing activities with other girls and their moms would be a fun way to stay close, and on the first get-together you're all going to: (choose an activity that the mothers know the girls in the group would like, such as going to the beach or having a "girls night in" to watch a movie they all love.) At sixteen and older, your daughter will likely be pleased to hear that you want to understand her and stay close with her now that she's almost an adult, and that you would like to invite her to come with you to a gathering of other mothers and their daughters to relax and talk or do something fun together. Download a sample flyer in Word (22K) or PDF (13K) format. Copyright 2008-2017, The Mother-Daughter Project. Site design by Anne Campbell Design.